The word comes from French charlatan, a seller of medicines who might advertise his presence with music and an outdoor stage show. 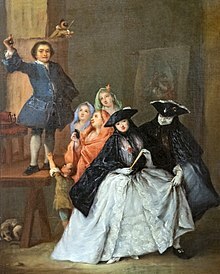 The best known of the Parisian charlatans was Tabarin, who set up a stage in the Place Dauphine, Paris in 1618, and whose commedia dell'arte inspired skits and farces inspired Molière. The word can also be traced to Spanish; charlatán, an indiscreetly talkative person, a chatterbox. Ultimately, etymologists trace "charlatan" from either the Italian ciarlare, to chatter or prattle; or from Cerretano, a resident of Cerreto, a village in Umbria, known for its quacks. 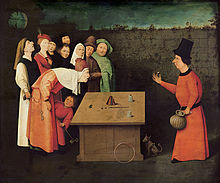 Hieronymous Bosch paints a scene of a Renaissance mountebank fleecing credulous gamblers. In usage, a subtle difference is drawn between the charlatan and other kinds of confidence tricksters. The charlatan is usually a salesperson of a certain service or product, who does not try to create a personal relationship with his "marks" (the persons to whom the service or product is sold), or set up an elaborate hoax or con game using roleplaying. Rather, the person called a charlatan is being accused of resorting to quackery, pseudoscience, or some knowingly employed bogus means of impressing people in order to swindle his victims by selling them worthless nostrums and similar goods or services that will not deliver on the promises made for them. One example of a charlatan is a 19th-century medicine show operator, who has long since left town by the time the people who bought his "snake oil" or similarly named "cure-all" tonic realize that it does not perform as advertised. A misdirection by a charlatan is a confuddle, a dropper is a leader of a group of con men and hangmen are con men that present false checks. A gaff means to trick or con and a mugu is a victim of a rigged game. In reported spiritual communications, a charlatan is a person who fakes evidence that a spirit is "making contact" with the medium and seekers. Notable people who have successfully debunked the claims of purported supernatural mediums include magician/scientific skeptic James Randi, Brazilian writer Monteiro Lobato and magician Harry Houdini. Albert Abrams, the advocate of radionics and other similar electrical quackery who was active in the early twentieth century. John R. Brinkley, the "goat-gland doctor" who implanted goat glands as a means of curing male impotence, helped pioneer both American and Mexican radio broadcasting, and twice ran unsuccessfully for governor of Kansas. Alfredo Bowman claimed to cure all disease with herbs and a unique vegan, alkaline diet. Alessandro Cagliostro (real name Giuseppe Balsamo) who claimed to be a count. Billie Sol Estes, a famous Texas conman. Gustavus Katterfelto a Prussian conjurer who used a solar microscope which he claimed could detect disease. Bernard Madoff, an American stockbroker who ran the world's largest Ponzi scheme, defrauding investors out of $18 billion. Elisha Perkins the inventor of his own quack therapy that utilized "tractors". John Henry Pinkard, Roanoke businessman and purveyor of quack medicines. Grigori Rasputin a self-proclaimed holy man and healer who gained considerable influence on the family of Tsar Nicholas II and was involved in the political turmoil on the brink of the Russian Revolution. ^ Chisholm, Hugh, ed. (1911). "Charlatan" . Encyclopædia Britannica. 5 (11th ed.). Cambridge University Press. p. 891. ^ Nash, Jay Robert. (2004). The Great Pictorial History of World Crime, Volume 2. Rowman & Littlefield. p. 364. ISBN 1-928831-20-6 "Gustavus Katterfelto launched a successful medical swindle. Passing himself off as a worldly philosopher and scientist, Katterfelto swindled Londoners with his sleight of hand tricks and medicine show for nearly three years. In 1872, he claimed to have invented the Solar Microscope, which he used to detect a deadly plague similar to the Black Death."